FIDE World Chess Candidates Tournament 2016: The Candidates Tournament is a chess tournament organized by the world chess federation FIDE. The eight-player double round-robin tournament to determine the Challenger for the World Championship title match in November this year. 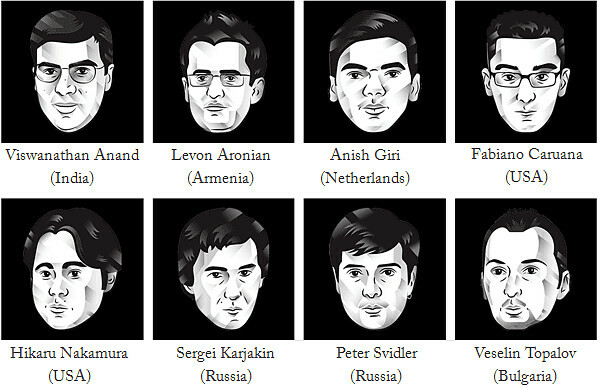 This FIDE World Chess Candidates Tournament 2016 will take place in Moscow from March 10–30. The guaranteed prize fund of the Candidates Tournament will be in excess of 420,000 USD. First prize is €95,000, second €88,000, third €75,000, fourth €55,000, fifth €40,000, sixth €28,000, seventh €22,000 and eighth €17,000. Check out the FIDE World Chess Candidates Tournament 2016 Schedule, Regulations, Participants, Live Streaming and Prize Fund from the below article. ICC Men’s T20 World Cup 2016 Schedule | Live Streaming & Teams. This FIDE World Chess Candidates Tournament 2016 will take place in Moscow from March 10 – 30 at The Central Telegraph, a historic building on Tverskaya street in the heart of Moscow, Russia. WorldChess.com is going to telecast the live streaming of 2016 FIDE World Chess Candidates Tournament. Click the below link to online watching of World Chess Candidates Tournament 2016. The guaranteed prize fund of the Candidates Tournament will be in excess of 420,000 USD. First prize is €95,000, second €88,000, third €75,000, fourth €55,000, fifth €40,000, sixth €28,000, seventh €22,000 and eighth €17,000. Click the below link to know the Rules and Regulations of FIDE World Chess Candidates Tournament 2016 in PDF Format. FIDE World Chess Candidates Tournament 2016 Rules & Regulations in PDF. Hope you like this FIDE World Chess Candidates Tournament 2016 Schedule / Fixtures, Dates, Venue, Participants, Prize Money and Live Streaming info. If you like this, Then please share it to your friends. World Culture Festival 2016 Art of Living Full Details & Live.